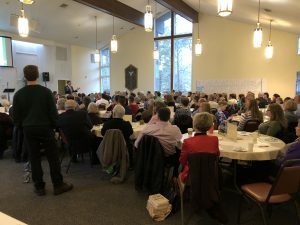 On February 4th, Greystone held the first of three Congregational Conversations in conjunction with the Senior Pastor Search Committee process. 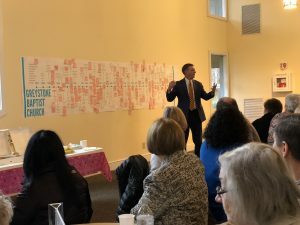 A robust showing of 156 members participated in energetic discussions on why we joined Greystone, what keeps us here, and what we feel are Greystone’s core values. Using notes collected from the conversation, the Senior Pastor Search Committee will compile data and report back to the congregation. The Committee anticipates it may take anywhere from 6 months to a year to complete our search, but we will keep the congregation informed along the way. Please continue to pray for Greystone in transition. A second congregational conversation will be held March 18th at from 4pm – 5:30pm in the Fellowship Hall. Bill Wilson will lead us once again, this time exploring Greystone’s present activities and vision. How is our church living out our mission? Your remarks and questions will lead the the Search Committee in helping to understand God’s wish for our church. Child care will be provided, but all youth grades 6 and up are encouraged to attend. The slide presentation utilized on February 4th will be posted on the website. A timeline was created for this conversation, of Greystone’s history in the life of our city, state, nation and world. It is posted in the Fellowship Hall. Drop by to see that document and save the date on March 18th for an informative and provocative discussion. We are striving for holy indifference, and to following God’s will for our church.